When you add What Were You Thinking? to your library you will receive all 6 episodes, each with a runtime of approximately 30 minutes. I love this series, loaded with fabulous interviews and in depth examples of kids led astray by their unformed brains. But I already knew that kids do crazy things. I know I did. These interviews entertained with in-depth examples. I thought the biggest value of these stories was the interspersed neurology research. I would have liked more of that. Having said that, I loved the posts and hope to see more. If you could sum up What Were You Thinking? in three words, what would they be? Absolutely! 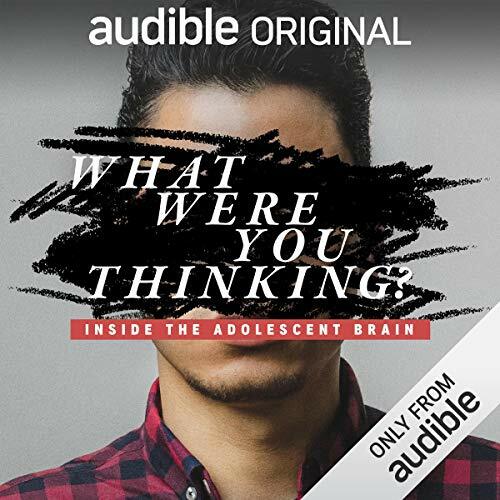 What Were You Thinking connects the social and scientific considerations of how young adults are shaped by their surroundings in our ever-changing world. Dina does a wonderful job drawing you into the story and engaging her audience. If you have kids or work with them, this is fantastic work. She consults experts and interviews kids going through extremely tough issues. It’s definitely worth a listen. As a former teacher, we only touched briefly on how minds develop. This is information I wish I had before entering my first classroom. The topics are not easy to listen to but do reflect what teens are thinking and how they respond. More importantly, the program also offers solutions. You may not agree with some of the topics but it is worth the listen, especially if you are a teacher, going to be a teacher or work with those between 13 and 24. Every parent of a preteen should listen to this! I was truly fascinated by how much information they were able to squeeze into each half hour episode. The science and research that they are exploring in the Adolescent brain versus the adult brain was very interesting and enlightening. The interviews we're also riveting. I recommend anyone with children, especially preteens, listen to this entire series and pay close attention to the stories and advice given by the people interviewed. Test test test test Test Test test teqTest Test TesTest tes tet test testTest tec. Juventus. A really interesting listen - I only wish it could be made into a book. Temple-Raston manages to make complex material accessible to all. Everyone should know about the teenage brain, especially those involved in education, criminology and adolescent mental health. While I enjoyed this as someone old enough to be a mother, I thought playing it in Highschool could actually do a world of good. an interesting and thoughtful series on how it can go so very wrong with developing brains and how society should be responding to this very preventable crisis and how some communities/societies are responding and reducing the damage. Interesting series with a nice variety of topics that are very current at the moment. Nice to listen to an episode on tge way to work.